Who is accountable for the right to education? Even though governments are primarily responsible for the right to education, civil society plays a key role in holding governments accountable for commitments and outcomes. Read examples on how citizen-led accountability is making positive changes across education systems. 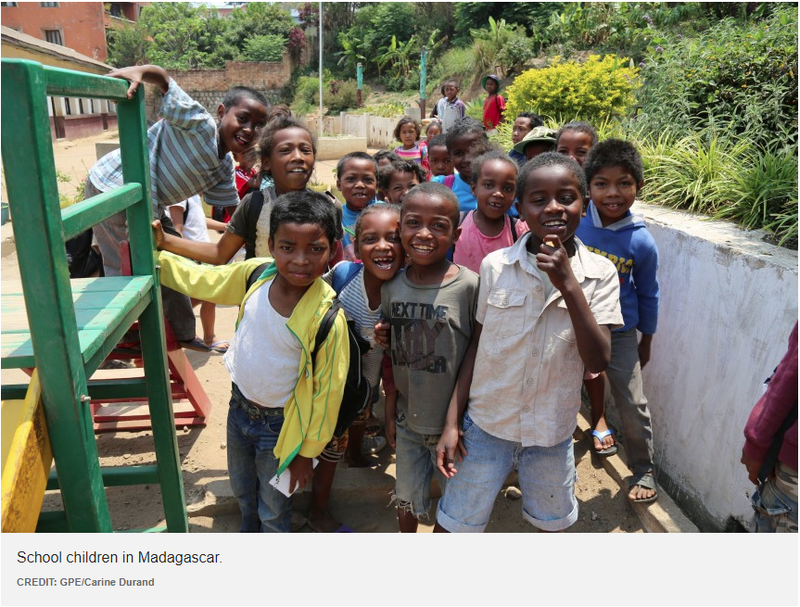 Cross-posted from the Global Partnership for Education Education for All blog. During Global Action Week for Education (GAWE 2018), education advocates and policymakers worldwide are discussing accountability for SDG 4 and citizen participation. Last year, UNESCO’s Global Education Monitoring Report highlighted that governments are the primary duty bearers of the right to education. When the government does not meet this duty, civil society organizations and citizens can step in and lever change towards the fulfillment of this human right. As Foro por el Derecho a la Educación in Chile describes, accountability includes both government-led efforts and the government’s responsibility to invite and include citizens’ participation in policy and programming. National efforts by the Education Coalition of Zimbabwe and HakiElimu in Tanzania highlight the need for further multi-stakeholder participation in supporting accountability linkages between civil society and governments. The GEM Report defines accountability as the government’s duty “to act when something is going wrong, through policy, legislation and advocacy, including through ombudspersons to protect citizens’ rights.” However, despite best intentions and efforts by governments, gaps can often remain between policy and implementation, or the laws and policies in place may not be leading to desired outcomes. In those cases, citizen action is often required to hold the government accountable to its responsibilities, such as upholding the right to education. For these reasons, some organizations, like Foro por el Derecho a la Educación, define accountability as “participatory control over the use of resources” — placing civil society participation as a necessary element for accountability within government processes. Citizen-led accountability takes many shapes, from research and advocacy to participation in policymaking processes and even strategic litigation. Only 55 percent of countries have a judiciable right to education, where citizens can take the government to court for violating their right to education (UNESCO, 2017), leaving civil society in many countries to rely mainly on research, advocacy, and engagement in policymaking processes (where accessible) to ensure that the right to education is upheld. Monitoring through indicators and objective measures can further support such social accountability. The Right to Education Index (RTEI) is one such tool to analyze and advocate for full satisfaction of the right to education worldwide. RTEI is a two-stage action research project, with one year of civil society-led data collection to complete the RTEI questionnaire followed by a year of advocacy using findings for national campaigns. RTEI supports citizen action to identify issues around the right to education and hold the government accountable to remedying them. For instance, after finding that over 8,000 girls in Tanzania are forced to leave school annually due to pregnancy, HakiElimu took the issue to 31 Members of Parliament, the Shadow Minister of Education, the Minister of Education, and other officials. Government representatives reported that they were preparing national guidelines to more adequately protect girls. However, one month after the Minister of Education brought the issue of girls’ education to Parliament, the President closed the debate. Although HakiElimu pivoted its strategy to successfully build popular support through media use and citizen mobilization, this case exemplifies the need for government responsiveness to citizens if social accountability is to be most effective. Another example of citizen-led accountability is the advocacy effort led by the Education Coalition of Zimbabwe (ECOZI) to eliminate the use of corporal punishment in schools. After identifying corporal punishment as “very common” in their RTEI research, with 60 percent of children under 14 being violently disciplined (UNICEF 2014), ECOZI conducted consultations with 31 teachers from different teacher unions, civil society representatives, and the Ministry of Primary and Secondary Education to discuss policy recommendations on alternative forms of discipline. ECOZI also presented findings regarding discipline to 200,000 listeners on a radio talk show and appealed to the ministry’s formal policymaking systems by requesting meetings with the Ministry of Primary and Secondary Education. The ministry hesitated to commit to policy change when they were engaged, but media mechanisms proved influential in building public support and knowledge about ending corporal punishment. ECOZI’s work, drawing on their RTEI findings, highlights that although citizens can call for accountability, the government is responsible for answering those calls. 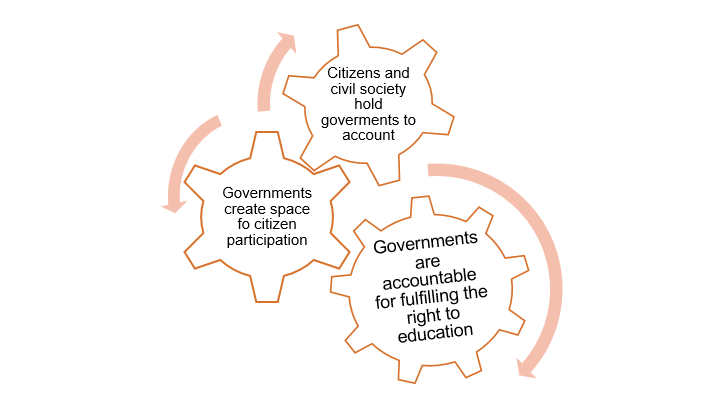 Although the government is the primary duty bearer of the right to education and civil society plays an accountability role when shortcomings are found, this government-citizen accountability loop nevertheless requires responsiveness on the part of the government to be most impactful. Through its model of multi-stakeholder partnership in education development, the Global Partnership for Education (GPE) is at the forefront of democratizing education planning and supporting civil society engagement in policymaking spaces alongside governments. As it continues its efforts to ensure meaningful dialogue between civil society and governments and increase responsiveness to citizen input, GPE may prove critical to closing the government-citizen accountability loop and heeding civil society input to make positive change across education systems.